JUVÉDERM VOLLURE XC softens moderate to severe parentheses lines and wrinkles by adding volume to the lines and wrinkles around your nose and mouth to produce subtle and long-lasting results for up to 18 months. Vollure – First and Only Hyaluronic Acid (HA) Dermal Filler FDA Approved for the Correction of Moderate to Severe Wrinkles and Folds, such as Nasolabial Folds. The makers of Juvederm Vollure formulated it to feature the perfect combination of gel firmness and smoothness. This results in a flexible formula that delivers subtle volume to diminish facial lines and folds. WHAT AREAS CAN BE TREATED WITH JUVEDERM VOLLURE? Juvederm Vollure XC is formulated to treat the nasolabial folds and marionette lines, which are the lines that show up on each side of your nose and extend to the corners of your mouth. 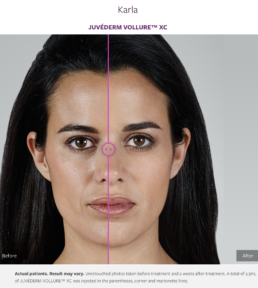 HOW IS JUVEDERM VOLLURE XC DIFFERENT FROM OTHER JUVEDERM FILLERS? Juvederm Vollure features Vycross technology. This technology involves using high and low hyaluronic acid to make a gel that’s more connected. One notable difference between Vollure and other Juvederm products is that Vollure is formulated for minimal swelling, which decreases your recovery time. WHAT PAIN RELIEF OPTIONS ARE AVAILABLE DURING A JUVEDERM VOLLURE TREATMENT? The pain relief options include applying a topical agent. Due to the size of the needle used and the presence of lidocaine in the injectable product, most people describe this and other injectables as comfortable. WHAT ARE THE POTENTIAL SIDE-EFFECTS OF JUVEDERM VOLLURE? The most common side-effects of Vollure are swelling and bruising at the injection site, but these go away within a few days. Lumps can also develop, but this is usually avoided as the injector at Nuderma Health & Med Spa is highly skilled. It’s important to choose the best providers to avoid adverse outcomes. You can download the before and after flyers here, or see below.